I tread with utmost caution. My eyes not leaving the ground. Petrified, wary of any sudden movement. With each step I take, I reassure myself all will be well and then I turn and scream! A furry rat jumps on my foot and scurries away to the opposite side. Saree clad women giggle while I sweat. I am at the Karni Mata temple or the Rat temple in Bikaner in Rajasthan and no, this is not for the faint-hearted ( read: those suffering from a fear of rats). I had travelled in Rajasthan extensively, but Bikaner had always eluded me. From Bikaneri Bhujia to the famed fort to the bustling bazaars, there were several inviting aspects that put Bikaner on my wish list since eons. Now it was finally happening, a week ago I was fretting to find flight tickets to Jaipur, just so that I could indulge in a road trip through the desert and also take a detour to Shekhawati. And today, I was sauntering around the fort, admiring at the Utsa art ceilings and the magnificent doors, each with an array of different colours. Bikaner is unlike other cities in Rajasthan. No, it isn’t covered under a pink sheen like Jaipur, it doesn’t have the laid-back vibes of Jodhpur. Neither does it have the fairy-tale charm of Udaipur, nor does it make you time travel like Jaisalmer. Is that a bad thing, you might ask? NO! Bikaner is starkly different from the rest of Rajasthan, with a unique flavour of its own. The fragrance of piping hot mangodis and the whiff of freshly made bhujia, the intricacies of Kundan jewellery and royalty of an erstwhile era. It is classy, rustic, chaotic, spiritual, regal, modern all at once. Now how do you define all this in one word? So what can you do if you have 2 days in hand in Bikaner? Here’s a travel guide for the first timer in Bikaner. Enter the majestic 15th century Junagadh fort and the first thing that strikes your eye is the cleanliness. Easily one of the most well-maintained forts, the complex is enormous and there are guided tours every fifteen minutes. It takes about two hours to see the various sections of the fort. I traverse through the various mahals: each with a distinct style: Anoop Mahal, Badal Mahal, Ganga Mahal, Chandra Mahal. Phool Mahal and Karan Mahal. The fort is a must visit for architecture and history lovers: a walk down the regal past of Bikaner that comes alive with the stories of the guide as he leads through symmetrical gothic archways to exquisite rooms. Do not miss the fine Utsa art on the ceilings and walls of the Mahals inside the fort. Utsa art is a traditional art form brought to India from Persia. In the present day, it is practised by national award recipient Mohammad Haneef Usta and a few others including Mr. Ayub Usta, Mr. Iqbal, Mr. Altaf who specialise in the Manovati Gold Nakkashi art form. 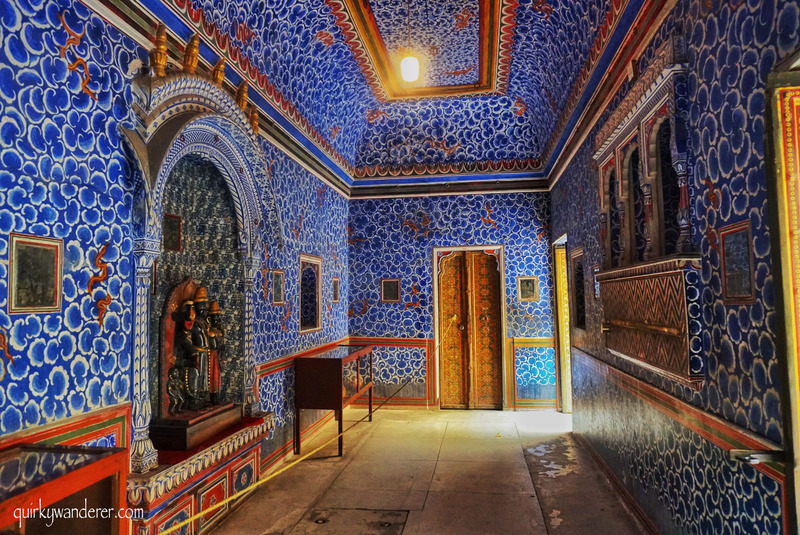 A thirty km drive from Bikaner city takes you to Deshnok, the abode of Karni Mata and over 20,000 rats. Behind the gigantic, silver gates are legends and bizarre stories that make the Karni Mata temple a strange yet must visit attraction. According to the legend, it is believed that Karni Mata of the Charan clan, believed to be a form of Goddess Durga, brought back her youngest son from the jaws of death and he was reincarnated a rat. She decreed that all the members of her family will not die but be reincarnated as rats. In Deshnok, almost all families claim they are descendants of Karni Mata and believe they will be reincarnated as rats. This is why the 20,000 rodents in the temple are fed and worshipped. No wonder the temple is full of rat poop and food filled in crevices. If a rat eats the food you offer or scurries over your foot, it is considered auspicious. But if you spot a white rat, you are considered extremely lucky. Nothing happened to me. No white rat because my eyes were glued to my feet, no rat over my feet because I think they were more scared of me than I was of them and feeding a rat was simply out of question! And yes, did I mention that if you kill a rat accidentally in the temple, you have to offer a silver or golden rat to the goddess. All my evasion effort was worth it. P.s: You have to enter the temple barefooted. The Bhanda Shah Jain temple is made of Ghee! When I climbed the flight of steps to reach the Jain temple set in marble, little did I know that I am entering one of India’s most unique temples. Vibrantly painted doors with figurines and ornamental ceilings welcomed me as I looked up in awe. Like all Jain temples, this one was opulent too. With latticed marble windows and impeccable floorings, Utsa art was on display even here. Golden paint interweaved with floral motifs, green and red doors aplenty and a quiet atmosphere to soak all of this in. The priest explains the story of the temple, revealing that the foundation of the temple is built with ghee mixed with mortar. My eyes widen with disbelief and wonder both, as he explains how yellow patches can be seen in peak summers, as the ghee begins to ooze out. Legends say that the temple was built by a wealthy Jain merchant, Bhanda Oswal in the 14th century. After his death, the temple construction was completed by his daughter. An approximate of 400000 kgs of ghee was used in the temple construction. As I circumambulate the temple dedicated to the 5th Jain Tirthankar, Sumatinath, I see the intricate gold work in every nook and corner, making it an art museum of sorts. The best part of my visit was chatting up with the priest who had immense knowledge and was so eager to share it. The Rampuria havelis and the vintage jeep! Start your day early before the hustle bustle of the main city begins. The tiny alleys and crowded lanes will be a deterrent if you wish to capture the beauty of these erstwhile havelis, which look even more gorgeous when sun-kissed with the first rays of the sun. Jharokas and jaalis adorn the sandstone facades of these historic havelis, constructed in the striking red Dulmera sandstone by the wealthy merchant clan of Rampuria in the 1400s. In my rendezvous with these havelis, there was hardly any intrusion. Occasionally a cow, a few passing cyclists and that is about it. I chat with one of the locals who peers out of her window to converse with me, as I walk through these glorious buildings with Rajput, Mughal and British colonial influences. There are arched doorways and delicately carved windows. But there is also a vintage air, something that evaporates as soon as you head out away from the havelis into the neighbouring bazaars. Incessant honking and a blend of fragrances welcome me as I enter the Kote gate market. A long stretch of local shops selling chillies, to clothes, to namkeens to jewellery. Visit the bazaars in the noon. No kidding. If you wish to savour the delights of the markets. Saunter by the Chotu -motu ki dukaan near the station for delectable kachoris and sweetmeats or head to Chunilal Talwar sharbat Wala on jail road for your dose of Khus and rose sharbats. For those looking for impeccable imitation Kundan jewellery, make your way to the hidden BC Jain jewellers in Bada Bazaar. Bikaneri bazaars have something for everyone. Like any Rajasthani city, the markets are a delight and needless to say, a riot of colours. If you are a guest at Hotel Narendra Bhawan, the perfect way to end your day, would be a mesmerising sundowner at the pastures an hour away from the main city into desert, peppered with soothing flute tunes and a glistening water body for company. On Balveer’s insistence, I try out the Bikaneri breakfast giving the regular, contemporary brekkie a break. And as I dig into the tangy, bittersweet Methi sabzi with piping hot pooris, I realize why he has this huge grin on his face. The Bikaneri breakfast spread in Narendra Bhawan is pure indulgence. Bikaneri kachori and sago uttapams secure a narrow second place but the winner is, of course, the palatial hospitality. Narendra Bhawan represents the lifestyle and tastes of Maharaja Narendra Singh with sophisticated interiors, chic artifacts, modern amenities coupled with a discerning sense of style. There is vibrancy in the decor but it is not overbearing. There is heritage in every nook and corner but more vintage than traditional. While Diwali chowk transports you to a regal era, the plush interiors of the spacious rooms make you revel in modern luxury. An exquisite blend of antiquity, grandeur, exquisiteness, peppered with warm hospitality and personal attention. The managers take efforts to personally look into the nuances of your stay making sure everything is in order. Having stayed at a host of hotels in Jaipur, that were mostly on the lines of reformed havelis, I expected Narendra Bhawan to be one of those heritage hotels with a rustic charm. But they surprised me and how, with their signature style of living a Maharaja’s life with a stylish demeanour. A stay at the Narendra Bhawan is an absolute must if you treasure an amalgamation of a glorious past with a unconventional present. The experience is worth all the mention. Nice read on Bikaner. Definitely on my travel cards. Thank Niranjan. Bikaner definitely has a character of its own. Not sure I have the guts to visit the Karni Mata temple 🙂 Been reading with fascination about the grandeur of Bikaner and your images totally match with the image I have developed in my mind 🙂 Looking forward to being there in person. Sooo beautiful. Loved your pictures that capture the grandeur inits truest form. HAve done Jaisalmer, Jodhpur and Jaipur. Yet to do a Bikaner. Bikaner is beautiful. I planned a visit to Bikaner for March 2018 but husband refused 🙁 He does not like the idea of visiting Karni Mata Temple full of rats. Your blog post is so detailed and informative, by God, dil khush ho gaya. Keep travelling, keep sharing. Well done. Truly Beautiful. Loved the post. Your post compels me to visit Bikaner. The pics are just too gorgeous! I see that you love capturing doors and windows. They certainly make up a fascinating frame, don’t they? I am assuming Bikaner is in India? It might be a good idea to mention that in your post, or at least in your tags, for those of us who live way across the world. It certainly looks like an intriguing destination. Holy Smokes! The architecture looks insane here so beautiful! I would totally love to travel in a place like Rajasthan! Very cool, also I have never been to a proper bazaar which I think would be great. This is as perfect an itinerary for Bikaner as it could get! The details with timings are superb. If I were to go there, I would just pack the mouthwatering food and take my own time exploring the architecture of the city. I have read about rat temple earlier also, it so very unique – where in the world would you find such a thing! I love the detailing on the temples and the stalls at the marketplace. You stories and photography really help bring me into Bikaner. I think I would keep my eyes out in a rat temple too. It’s cools and a little unnerving at the same time. It would especially be unnerving if the stories were true and you stepped on a reincarnated princess in rat form. The colors in that city are absolutely stunning! As a veterinarian the first thing I think of with rats is what diseases are they carrying? The first one that comes to mind is the plague and I wonder how many people have gotten sick from contact with these rodents. I know it’s morbid of me to say that, and yes I think rats are amazing creatures, but I also know the other side of things. Just a thought. Wow, beautiful photos! So much colour! The rats at Karni Mata are so cute! I wouldn’t mind going. And a temple made of ghee, that’s crazy, I never would have thought a building would be made out of ghee. Thanks for the post, I learned a lot! Love the colours from your photos. I would love to visit Junagadh fort and the bazaars sometime! We also found Bikaner a fantastic place to stop on our massive road trip through Rajasthan. While it’s different from its more popular cities in the region, it offers a nice off the beaten path view of Rajasthan. Thanks for sharing – you brought back a lot of great memories we have of this town. Whew! That was sensory overload! I’m heading to Rajasthan many months from now and seeing your post about Bikaner, I’m already overwhelmed as to which cities to prioritize when I finally start planning for my visit. Bookmarked this post! We have visited Rajasthan thrice but could not plan to visit Bikaner. The Junagarh fort looks magnificent and interior is stunning enough like any other palaces and forts in Rajasthan. Rampuria Havelis looks like something not to miss too. Loved the way you have described the unique charm of the city. I absolutely agree with each word here. I had visited Bikaner during the Diwali time and the city was clad in colourful lights , illuminating it’s vintage charm. I would like to add just one more thing here. Bikaner also has a camel research centre where one can see almost every breed of camels that can survive in Asia. It is a must visit for the animal lovers. The architecture and mainly the decorations look just majestic. I probably wouldn’t visit the rat temple, though. I’ve been to Lop Buri to the monkey temple and I found that the monkeys with their grey fur and their long tales looked a bit like rats – I didn’t feel very comfortable. But if I skip that one, I guess there is much more to see. I just love the colors and the designs. Jaisalmer and Bikaner are the places in Rajasthan that I have not explored. Lately I have been seeing pics of Bikaner and now reading your post, your pics are giving me FOMO, hahah! Rajasthan is one of my favourite states in India. Many people had advised me not to travel there because they felt it’s too touristy but still, I believe that Rajasthan is touristy for the right reasons – beautiful and extraordinary. The architecture is so colourful and ornate. I feel I can spend hours lingering through those alleys and in those vibrant palaces. Bikaner is so picturesque and an awesome travel destination.The architecture alone is breathtaking. I’m sure you can spend hours wandering around the badal Mahal and taking photos.